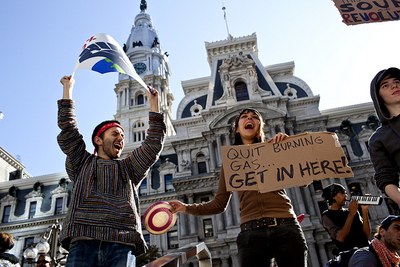 Dylan Hewitt and Monica Hartlove, both of Philadelphia, participate in the Occupy Philadelphia protest in front of City Hall on October 7, 2011. Photo by Metro Philadelphia. Editor’s note: This account is a strong example of why systems of control often times backfire. It also exposes the truth that governments often use the law to their advantage, as the author’s experiences dealing directly with the city illustrate. The allegations made in this piece can be independently corroborated. You can follow Julia Alford-Fowler on Twitter: @jalfordfowler. – D.S. In the mind of most American citizens, local government officials exist (at least the majority of the time) to serve and answer to the people who elected them. It is within this system of accountability that we rely upon to make sure our best interests are being served. While I had a healthy amount of skepticism, this was my held view until the fall of 2011. I believed that the Mayor of Philadelphia, Michael Nutter, and his staff were in office to protect their citizens, myself included, and that the problems of this country were for the most part the result of unchecked corporate greed on Wall Street, amid a variety of other issues. What follows is an account of how my thinking was transformed from this moderate view of a trust in those in power into one in which my faith in our government and specifically, those who govern, was destroyed. For me, the Occupy Movement started with a purpose of giving a voice to the voiceless and a way for all of us who were angry at the state of our country to come together and create real change. I believed that this could be accomplished through dialogue and negotiations. Over the course of the two month encampment in front of City Hall in Philadelphia, I saw the necessity of the people’s voice to override the restrictions set to us by our lawmakers. I saw first hand that these lawmakers who were put into office through corporate dollars often do not serve the people who cast the ballots, but instead work to protect the interests of those who funded their campaigns. I began to ask myself the following: What makes free speech free? Is it something that falls within guidelines dictated by the government (as in such guidelines as “time, place and manner”) or is it citizens finding their voices and expressing them how they see fit, especially if they are not causing harm to another person? At 7:00 am on October 6th, I stepped onto Dilworth Plaza full of hope, love and passion. What was sweeping our country had inspired me to throw myself head first into something I had never tried before – activism. What had happened with the NYPD at Occupy Wall Street disgusted me, but that was New York and as far as I could tell, Philadelphia was going to be different. I had already been told that the city was looking forward to working with us, that they were excited about this showcase of democracy at the footsteps of City Hall and that they wanted to present Philadelphia to the rest of the country as “The Cradle of Liberty.” All they wanted in return was a small group of people to act as liaisons with them and for us to apply for a permit. Over the course of the day, a small group of people decided that I would start out being that “liaison”. 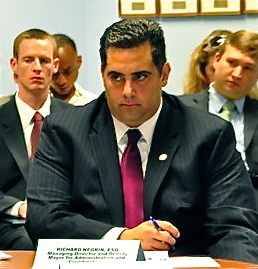 Richard Negrin, Deputy Mayor and Managing Director for the City of Philadelphia. Photo from his personal Twitter account. 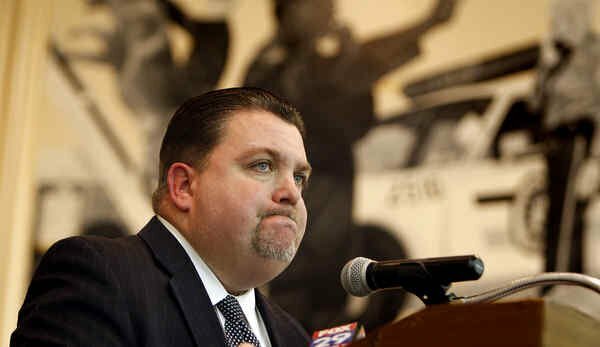 By 6:00 pm that day, I was sitting in the office of Richard Negrin, Deputy Mayor and Managing Director for the City of Philadelphia. During our conversation he said one thing in particular which struck me as unusual, but in the flurry of activity, I pushed it aside: If we get a few weeks into this and we need to boost publicity for the movement, they could help us stage an arrest. A top-ranking city official just told me that they would be willing to set up a situation wherein 10 or so people lie down in the street and they would very politely cuff them and haul them away to jail. In a later meeting with our small team of city liaisons, he repeated this statement and was echoed by Everett Gillison, Deputy Mayor of Public Safety and now Mayor Nutter’s chief of staff. Gillison confirmed this tactic, saying that it was something that they had done in the past and we simply needed to let them know how many people, at what time, and they would work with us to coordinate these arrests. I should note that we never took the administration up on their offer. Over the next two weeks I began to see a pattern in which the city was happy to have us there as long as they were able to subtly control our actions. When it came to the permit, the city was anxious for us to sign this piece of paper that would change our camp from a space that was a reclamation of public property for use by and service to the people of Philadelphia, to them granting us permission to be there under their oversight and control. Supposedly open-ended, once signed we could have access to electricity and protection from “other groups” trying to take over the space. At one point, Negrin called to warn me that we should sign immediately because the Tea Party had applied for a permit and they could only hold them off for so long. After checking around, I discovered that no one in the administration could confirm that this was the case. Once the permit was signed, we were given a long list of complaints from the city that we had to fix about the camp, which then dominated three weeks of daily General Assemblies. The pattern continued to build. As soon as we resolved one issue, the city would present us with another one, each of which would dominate endless hours of our time. In regards to the “city liaison working group”, the General Assembly eventually voted to dissolve the working group and grant the role of communicating with the city on our behalf to the Legal Collective, which I then joined. After the first and only meeting with the mayor and his staff, the General Assembly decided to answer the Mayor Nutter’s request for weekly meetings with a simple answer: No. We made clear that Occupy Philadelphia did not intend to cut off communication, and that continued emails and letters would be exchanged with the administration. I saw this as our group making the statement that we were going to protest on our terms, not theirs. I believed that as people of the United States, it is our right to do so. The government is supposed to be for the people and by the people. We would no longer tolerate a country in which our government’s voice is more important than that of the people who elected them. Additionally, we were demanding that all communications with the city be documented in order to protect our rights. As any meeting with the city in person was not allowed to be recorded, we refused to participate. What happens when citizens decide they are no longer going to allow the suppression of their voices by the government? Shortly after we notified the Mayor’s office of our decision, on November 12th, there was a sexual assault at the camp. 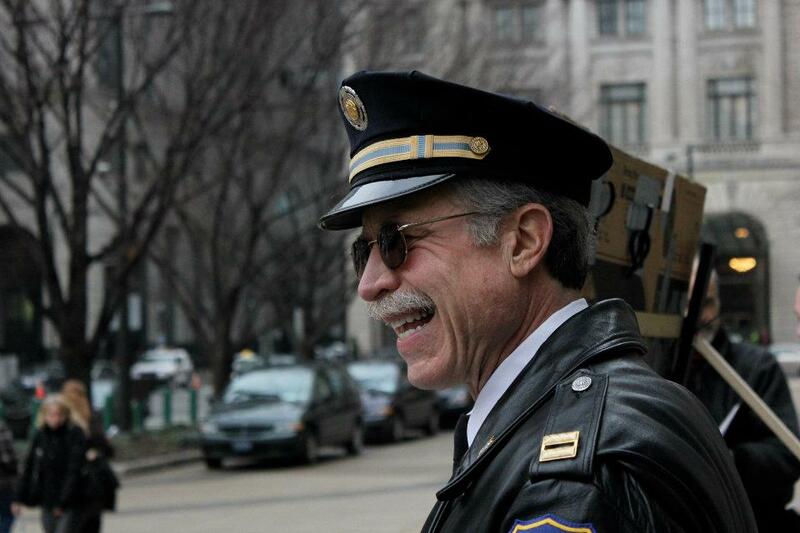 The following day, Mayor Nutter held a press conference which he used as a platform to attack Occupy Philly. He mentioned the assault in passing for only one sentence. During the conference he made the following statement, “Many of the people that we talked to in the beginning of this event and activity are now gone. They are no longer on the site.” The Mayor of Philadelphia blatantly lied. All of the people that the city had worked with from day one, myself included, were still there. The only thing that had changed was that we were no longer allowing ourselves to be controlled by a system that served to protect the status quo. Incidentally, this press conference was held less than a week after the Mayor’s reelection bid was secured. The mayor’s main complaint against Occupy Philadelphia? Sanitation. How many times have you walked through the subway and it smelled of urine? Or walked through your neighborhood and stepped around broken glass? Where is the press conference condemning these issues? Luckily for the city, they found a new pawn in the form of a recently established group, Reasonable Solutions. In reaction to the General Assembly’s earlier decision to resist eviction, the leaders of this group set up a meeting with city officials and applied for a permit for Thomas Paine Plaza, located directly across from Dilworth Plaza. When the city handed one proposed permit to them and one to Occupy Philadelphia, it was entirely restrictive. It allowed for a single canopy tent and was limited to the hours of 9am to 7pm. In effect, it negated the purpose of our protest – no occupation. 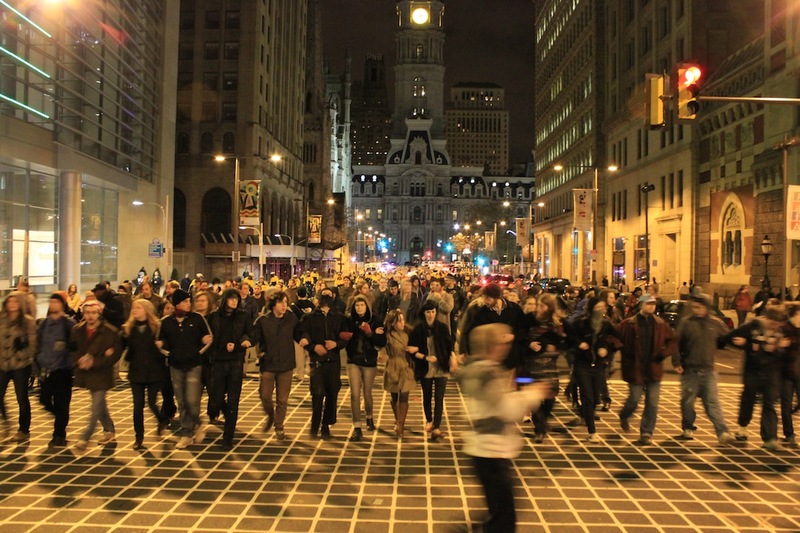 While Occupy Philadelphia submitted an appeal, Reasonable Solutions did nothing. Shortly after we were notified that our appeal had been denied, the city held a press conference to showcase Reasonable Solutions signing the new permit. This gave the city every excuse to evict us without any further negotiation. Because a group that vaguely resembled Occupy Philadelphia had been willing to sign this permit, the Mayor could now say that they had done their due diligence, and to the common observer, they had. Within a week, the city had us evicted. Late on the night of November 29th, roughly 400 riot cops, countless bicycle cops and what I counted as eight mounted officers on horses, all assembled to challenge approximately 100 protesters. At this time there was evidence that the evictions were being coordinated by both a series of nationwide conference calls between Mayors and later calls between Police Chiefs that were set up by the Police Executive Research Forum (PERF). The fact that this show of force to evict our camp was beyond excessive should come as no surprise given that our police commissioner, Charles Ramsey, is the President of the Board of Directors of PERF. This video clearly shows the officers first moving people onto the sidewalk and then, once they are on the sidewalk, charging into the crowd and overtaking the sidewalk. Once I returned home I watched the rest of the events unfold via livestream and the ABC livefeed. What follows is the first hand account from friends who were on the scene: After this incident, the evicted protesters kept marching through the streets with chants of “You can’t evict an idea!”. As the march was beginning to wind down, the police kettled in half of the crowd, abused several of the marchers, including an African-American male who was punched in the kidney multiple times. Even if the kettled marchers were given a dispersal order, which they were not, they had no means of leaving. Instead they were told to get on the sidewalk or they would be arrested. They got on the sidewalk and were subsequently arrested. From the beginning I made it my maxim that I would work with the city until they harmed my people. Early in the morning of November 30th, they harmed my people. I awoke to the fact that this sort of abuse of power had been occurring throughout this city, country and world for centuries and I was just beginning to join a fight that was vital, powerful, terrifying and righteous. While I may never understand what it is to risk my life in Syria, or to be threatened by police in the poorest neighborhoods in this country because of my skin color, I now see the danger of any government which has more power than that of its people. There is an inherent necessity for all of us to rise up, stand together, and make our voices heard through action. A formidable NYPD presence holds one side of the exit ramp while an equally-large throng of soaked, defiant youth face them on the other side. I’m heading back towards the ramp after witnessing a white-shirted police supervisor commandeer a public bus, ordering the passengers off and instructing the driver to turn around and head back to the Brooklyn Bridge. The bridge has been shut down for over an hour now. When the bus arrives, hundreds upon hundreds will be arrested and boarded onto the bus, as well as police vans. Meanwhile, the protesters on the street begin chanting to the police: “We pay YOU! We pay YOU!” and “It’s OUR bridge. It’s OUR bridge!” as a cold, driving rain fails to dampen their spirits. Arriving four days earlier, I had hoped for, and was greatly disappointed when, a short list of demands never materialized from the occupation’s General Assembly. Repeal corporate personhood. Remove special interest money from elections. Something. 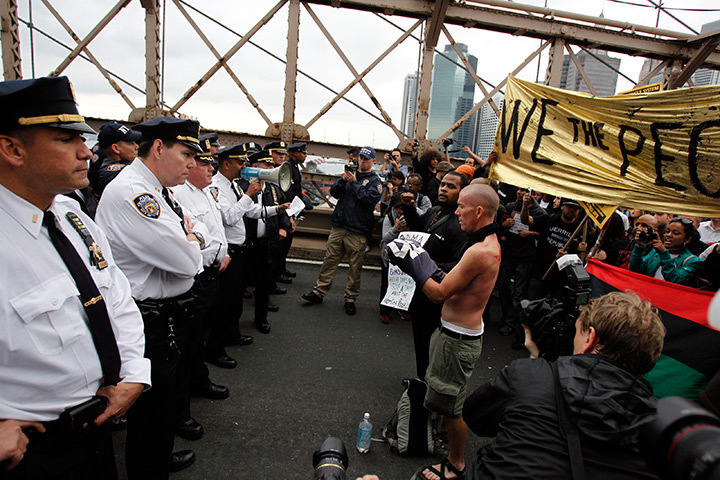 Yet by the fourth day, standing at the entrance to the Brooklyn Bridge with this standoff, it was clear to me that the Occupy Wall Street movement had evolved. The occupation at Liberty Plaza may outwardly appear to be just a large encampment of hundreds of tired, exuberant, unwashed people. But it’s an incredibly subversive idea. What the occupation has managed to do thus far is set up a center for agitation on Wall Street’s doorstep, while simultaneously stand up to the most militarized police force in America. In that brave act of defiance, they’ve begun the process of recapturing public space to assemble and foment resistance against a corrupt system, a public space lost to us after 9/11 (with the introduction of “free speech zones”) and just as importantly, begin to remedy the fear and cynicism so many Americans have been feeling for well over a decade now under the hand of a police state and a domestic intelligence apparatus unparalleled in American history. The Founders clearly understood that the right to assemble was of key importance to those who wanted to correct wrongs done by their government. If they could not assemble, they could not achieve their goals. Liberty Plaza is a long-overdue civics lesson. The protesters have collectively said, simply by holding the plaza: This is OUR square, the PEOPLE’S square, and we have a right to assemble and organize a campaign against the economic and civil injustices perpetrated by the plutocrats and their tax payer-funded security service, the NYPD. They’ve managed to pull back the curtain and expose the police state which works to protect the ruling elite’s interests at the expense of the citizens they originally took an oath to serve: CIA-trained NYPD counterintelligence squads; videotaping the faces of peaceful protesters to feed into a facial recognition database; commandeering public buses for mass arrests; entrapment; kettling and pepper spray. 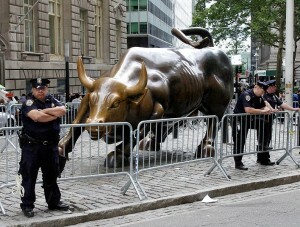 And perhaps the most audacious: A $4.6 million bribe, ostensibly for new laptops, given by JP Morgan to the NYPD. All of this against peaceful citizens who are the living embodiment of a wildly-popular sentiment in America since 2008: the rich and powerful in this country have gotten away with too much. When Americans demand fundamental change and refuse to rely on or even trust a thoroughly-corrupt system to achieve that change, they must begin at the root of their oppression, and it’s as simple an idea as occupying public space in the face of police intimidation. 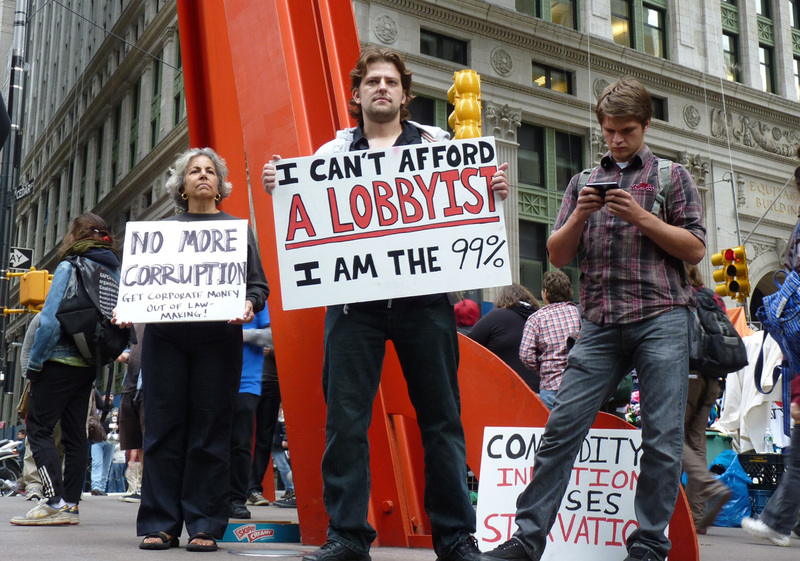 If you would like to donate to #OccupyWallStreet, visit the New York City General Assembly website. The Project is leaving Wall Street to report on the Boston occupation, and then to Washington D.C. for the major October 6th occupation in our nation’s capital, but we can’t do it without your help. If you enjoy my work and would like to help me cover expenses such as travel, food and gear, please consider donating to the David and Goliath Project’s #Occupy Media Fund. Denial-of-service attacks and similar tactics are becoming more widely used as protest tools. The political movement known as Anonymous has managed to capture the attention of the media, the hearts of many supporters, and the ire of many spectators after an eight-month spree of political interventions, stretching from Distributed Denial of Service (DDoS) campaigns, to human rights technical assistance in Tunisia, to a more recent spate of hacks under the guise of Operation Antisec. The state has now fully entered the fray with its own flurry of activity. In the past month, twenty-two alleged participants in the United States and the United Kingdom have been arrested, the bulk of them (14) in connection with a single operation: the spectacular wave of DDoS attacks aimed directly at protesting actions taken by Mastercard and Paypal in December 2010. These were launched after these companies refused to accept donations for Wikileaks front man Julian Assange, soon after the activist organisation released a trove of diplomatic cables. Hackers and activists supporting the DDoS campaign (and certainly not all do support the campaign) regard this act as legitimate protest activity, akin to a blockade or “digital sit-in”. Yet, if convicted, the participants of Anonymous could be charged with felonies and land in prison with excessive punishments. On July 20, 2011, a day after the US-based arrests, FBI officials offered a rare glimpse into its justification for the crackdown, citing a need to nip “chaos” in the bud: “We want to send a message that chaos on the internet is unacceptable,” said Steven Chabinsky, deputy assistant FBI director. Although most of the arrests were for the DDoS campaign, the FBI official never differentiated between hacking and DDoSing. The former is defined by computer break-ins or trespassing, while the latter refers to gumming up a server by bombarding it with too many requests. Curiously, this official also never went so far as to label the alleged participants criminals, terrorists, or vigilantes. By complaining about Anonymous’ (hereafter Anons) tactics in the absence of any stated criminal offense, the FBI appears to acknowledge, if in a somewhat oblique fashion, that the hunt for some Anons is politically motivated. The FBI also appears to acknowledge that, in contrast to terrorists and criminals, whom the state is justified in prosecuting since they have violated the contract that ostensibly undergirds social norms in modern civil society, Anons are in fact exercising their rights as citizens to demonstrate on behalf of “causes” they believe in: “[Even if] hackers can be believed to have social causes, it’s entirely unacceptable to break into websites and commit unlawful acts. There has not been a large-scale trend toward using hacking to actually destroy websites, [but] that could be appealing to both criminals or terrorists. That’s where the ‘hacktivism,’ even if currently viewed by some as a nuisance, shows the potential to be destabilising,” insisted Chabinsky, in language that mirrors critiques of 1960s-era social movements. Of course these brief statements should not be taken as the state’s sole, much less its final, words on Anonymous. They are interesting insofar as they gesture toward a social fact concerning Anonymous’ increasingly prominent role in social protest movements: Many of their actions are politically motivated and conscientious, and the December 2010 DDoS campaign, Operation Avenge Assange, was no exception. Whether or not one agrees with all of Anonymous’ many tactics – some of them being illegal and disruptive, others falling in the province of peaceful and legal human rights assistance, and still others in a gray moral and legal zone – under certain circumstances, the DDoS can be considered as non-violent protest in line with well-recognised protocols for public assembly, the difference being the medium. Of course, as with any form of public assembly, some Anons are merely along for the ride. Others might in fact exhibit reckless behaviour. But this is an inevitable feature of Anonymous’ platform, open to seasoned activists and newcomers alike: Some novice participants cut their teeth on politics for the first time with their Anonymous brethren, forming, no doubt, an individual political consciousness, which has fed into a more robust sense of democracy in action, especially after Anons held campaigns in support of the uprisings in the Middle East and Africa that have helped to displace authoritarian regimes that had managed to exploit their constituencies for decades on end. 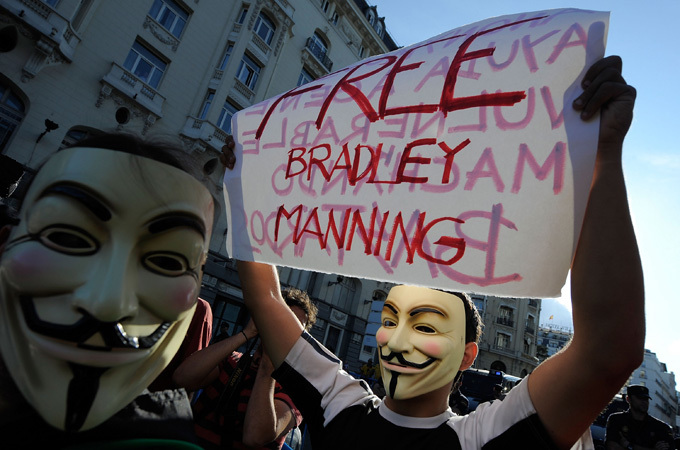 Even if the FBI is ambivalent about explicitly denouncing Anonymous as a criminal threat, its tactics of arrest and intimidation and their criminalisation of all tactics used by Anons, such as DDoS, constitute an approach to security and surveillance that deserves critical attention, especially if any of these arrests move to trials. There are many ways to think of the DDoS campaign against PayPal and Mastercard, but one way we might think of it is as digital direct action. Emerging organically, this movement did not wait for a judge, politician, nor a journalist to declare a legal or moral judgment. Citizens took matters into their own hands. In less than 24 hours, a large assembly of citizens took not to the streets where protest activity traditionally unfolds, but to the digital agora to act on their own accord, to loudly assert their opinion on a matter, and to act directly against those actors they felt were acting unjustly. If they happened to break laws, these laws were viewed, with good reason, to be unjust. 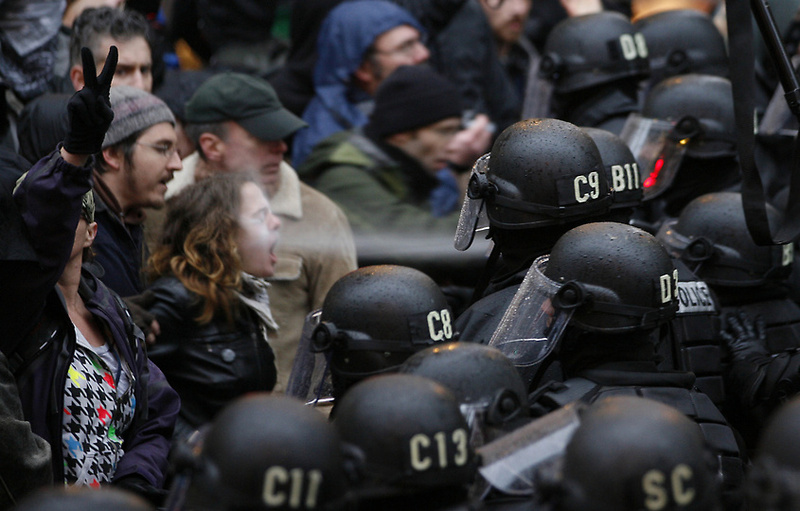 Like all traditions, direct action is diverse in its make-up, tactics, history, and purpose. At times, activists seek to block access in order to protect a resource, as with tree sit-ins in the Pacific Northwest or blocking Japanese whaling ships in the Southern Ocean as carried out by Sea Shepherd. 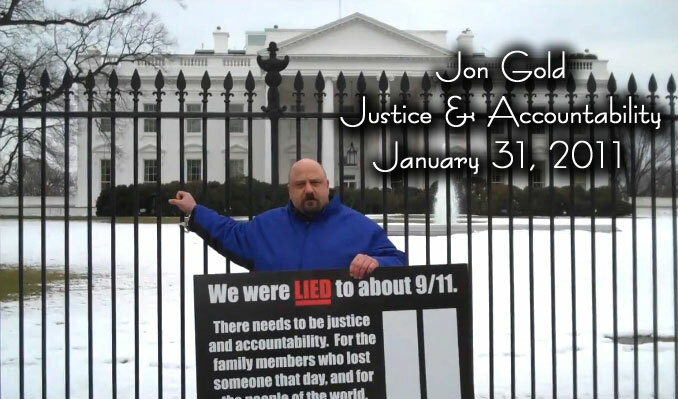 In the long tradition of Plowshares actions, the intent is to get arrested in order to publicise an issue. 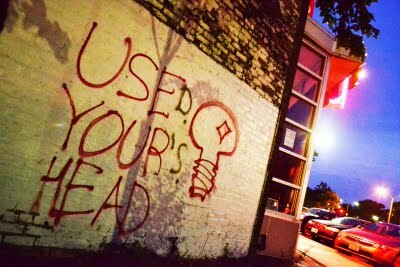 Anonymous rendered Mastercard and Paypal’s webpages defunct for a number of days by flooding their servers with too many requests and did so to garner media attention, to make their platform visible, and to demand that Assange be given due process. In this sense, they were successful, no matter what the outcome of the case made against them. What made the events of December 2010 unusual – and extraordinary – as a moment of direct action poses a challenge for prevailing theories of civil disobedience. Many of the most notable acts of civil disobedience, even virtual sit-ins, have been organised by small affinity groups in which participants are public and typically well aware of the legal consequences of their actions. Some participants in these actions even have their lawyer’s phone number written on their arm in permanent marker. Anonymous, which prides itself on not having a readily identifiable, corporate form, was powerless to defend itself using these methods. Thus, as the December events unfolded, I was glued to the computer watching how Anons would or even could minimise the risk and chaos that to some degree characterised these interactions. Remarkably, “the hive mind”, as they refer to themselves, never spun out of control. They stayed on target and conjoined their disruptions with manifestos and videos explaining their rationales. But at the time, one thing was clear and has been repeated by sympathetic and unsympathetic observers alike: Many participants were likely unaware of the legal risk they were taking, and did not have lawyers to contact in the face of a future arrest. The spectacular events of December, combined with the recent arrests, have of course changed all of this; many of us have now been educated as to the risks at hand. The legal risks and the philosophical subtleties of DDoS as a disruptive direct action tactic no longer reside within the sole province of a smaller circle of activists who have practiced and theorised this tradition for over a decade. A much larger swath of citizens have subsequently entered the fray. In light of these arrests, whether or not DDoS campaigns are always an effective political sword to wield (and they are strong arguments to be made on both sides) is not the primary question that should concern us. The key issue is the evidence used to decide who is involved and to determine what they ought to be charged with doing. If a DDoS action is deemed as always and under every circumstance unacceptable – always a tactic of chaos – this will in the short term result in excessive penalties; in the long term, an excessive clamp down, such as felony charges for those that stand accused, could stifle these tactics altogether on the internet. This is damaging to the overall political culture of the internet, which must allow for a diversity of tactics, including mass action, direct action, and peaceful of protests, if it is going to be a medium for democratic action and life. Gabriella Coleman is an Assistant Professor of Media, Culture, and Communication at New York University. Her first book, Coding Freedom: The Aesthetics and the Ethics of Hacking, is forthcoming with Princeton University Press and she is currently working on a new book on Anonymous and digital activism. This editorial was originally published on Al Jazeera English, and is reproduced here in good faith under a Creative Commons Attribution-Noncommercial-No Derivative Works 3.0 Unported License.